If you think about it – really think about it – the best part of Memorial Day gets totally swept under a rug of burgers and shandies. The best part being dessert, of course. I mean think about it: as the weather warms up, so does the ferocity of your sweet tooth (think about it); berries are bright, flavorful and vibrant right now; and this is a light and fresh dish that looks equally at home on china or Chinet. 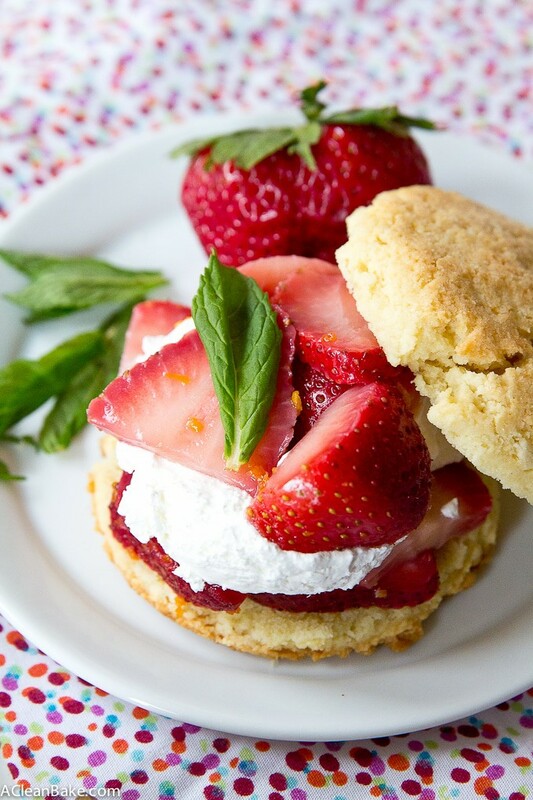 So, maybe dessert isn’t the most important part of Memorial Day parties – shortcake is. The best and most party-friendly aspect of strawberry shortcake is that, since it’s not intended to be served warm, you can and should make your life easier by making it ahead of time. The shortcakes can be made the night before and you can slice your strawberries in advance. I soaked them in the simple syrup but if you don’t have the lead time for soaking, you can always just drizzle the syrup directly over them. The only wild card is the whipped cream which can be made ahead of time, but not too far, for fear of it deflating! While I’d rather have deflated whipped cream than, say, a paper cut between two of my fingers, it still takes some of the magic out of the dish when it’s not topped with a sky-high pile of lighter-than-air whipped cream. So, plan accordingly. But don’t plan to spend too much time on this. 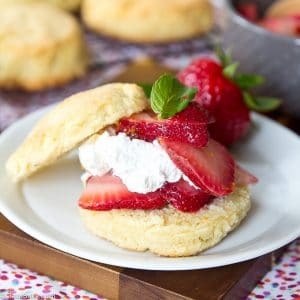 The shortcakes are fast and easy to make (and the recipe can be multiplied if necessary), giving you plenty of time to head outside into, hopefully, the sun with a cold drink in your hand. Quick and easy low carb and paleo strawberry shortcake that can even be made ahead of time! Gluten free, dairy free and low carb, too. Make the simple syrup first by bringing the water to a boil, then stirring in the stevia or honey until dissolved. Add the zest and simmer for 3-5 minutes. Remove from heat and allow to cool to room temperature before using. While the syrup is cooling, make the shortcakes. Preheat the oven to 450 and line a baking sheet with parchment or a nonstick pad and set aside. In a smaller bowl, whisk the eggs, then whisk in the butter or oil. Pour the egg mixture into the dry mixture and stir just until all of the ingredients are thoroughly incorporated. Scoop 3-4 Tablespoon portions (I used an ice cream scoop) and place them about 2" apart on the prepared baking sheet. Flatten the tops very gently with the palm of your hand. Bake for 10-15 minutes until lightly golden around the edges. Cool completely before slicing lengthwise, and topping with a scoop of sliced strawberries, a drizzle of simple syrup, and a dollop of coconut whipped cream. Garnish with fresh mint leaves, if desired. Serve immediately. If you can't or don't use baking powder, sub 2 teaspoons baking soda. Before you mix the butter or oil with the eggs, make sure it has cooled enough so that you can submerge your fingertip in it for a count of 5. Any hotter and it will cook the eggs! If your hand is sticking to the shortcake dough when you flatten the cakes, lightly grease or dampen your palm to avoid sticking. If you'd like, you can marinate the sliced berries in the cooled syrup for 30-60 minutes before adding them to the shortcakes. This will soften them and infuse them with a sweeter, slightly lemony flavor, which is wonderful, but if you're in a hurry or cooking for a crowd, skipping this step saves a lot of time. 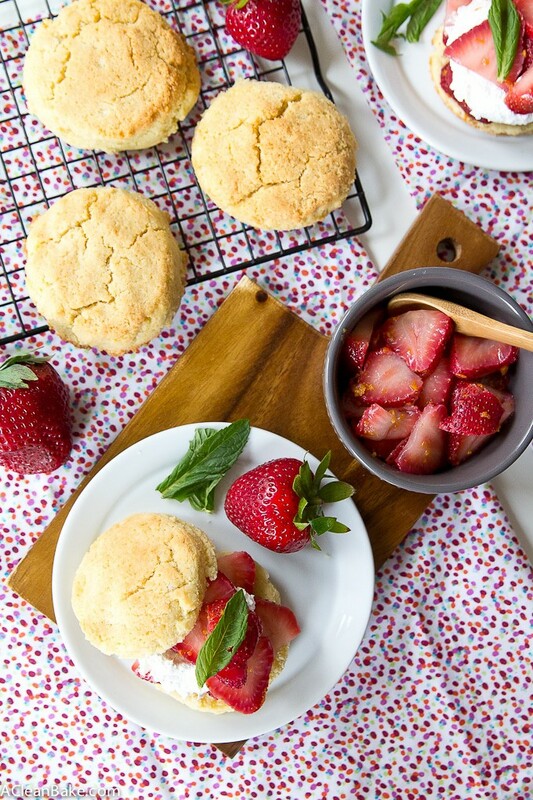 My Memorial Day Weekend needs these shortcakes on repeat! I’d definitely eat them for breakfast, snack, dessert, you name it! 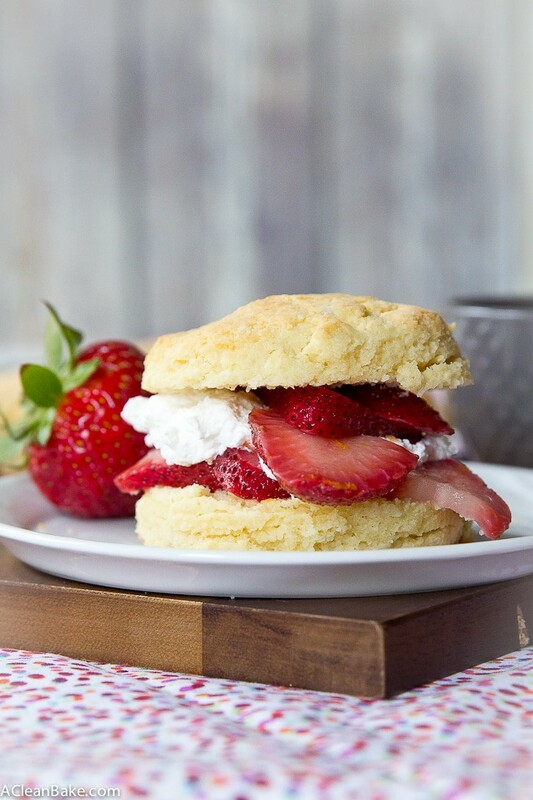 I’m loving how perfect the shortcakes look and those fresh strawberries? Drool! My family would eat these up in a heartbeat! Dinner! You should have them for dinner, too! 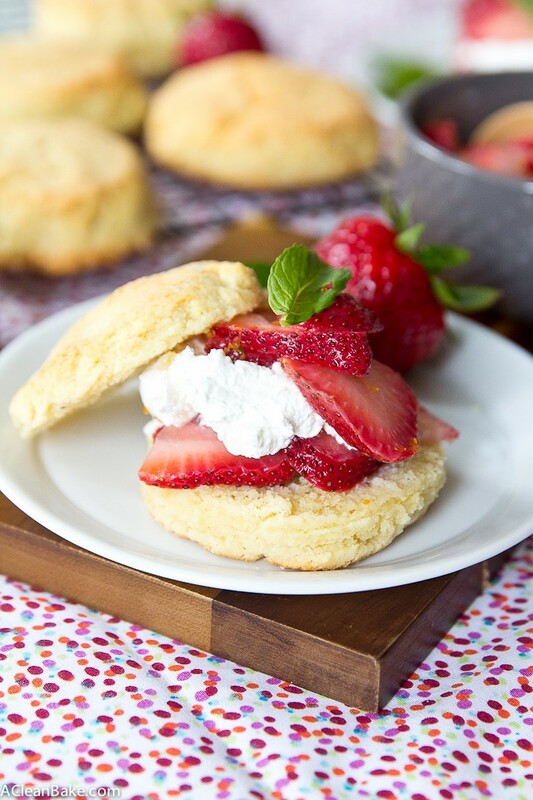 Shortcake is perfect for Memorial Day! Great recipe! I think so too! Thanks, Roxana! Looks delish Do you bake usign Brown Rice Flour? I have some in my pantry and dont know how to use it. Actually, I don’t really bake with brown rice flour. Brown rice is one of the grains that bothers my digestive system so I stay away from it. I’ve heard it is very absorbent (because of the higher fiber content) so I imagine it works similarly to quinoa flour. I’m sorry I can’t be more helpful but you might check Pinterest, which typically has recipes for everything! What is blanched almond flour? I have almond flour. How do I blanch it? Thanks. Blanched almond flour is a form of almond flour in which the skins of the almonds have been removed before the nuts are ground into flour, so the flour is a white/cream color and often ground more finely, which I prefer for baking. Unblanched almond flour (which might be labeled “almond flour”, “raw almond flour”, or “almond meal”, among other possibilities) is made from almonds ground whole, including the skin, which results in a two-tone cream and brown flour. It is often coarser which makes a larger crumb and crumblier baked good. You can use it if it is all you have but know that your end result will come out looking slightly different than the picture. It will still taste good though! Can the shortcake be made a day ahead? How best to store them? It can definitely be made a day ahead. Cool the shortcakes completely, wrap them tightly in plastic so that they are airtight and store overnight at room temp. These look fantastic! Do you think they would hold up well to freezing? I’d need to make them about 5 days in advance. If so, would you recommend portioning them out and freezing raw, baking day of? Or would it be better to bake and then freeze, just thawing out day of? Yes, you can definitely freeze them! Ideally, you’d freeze the dough, then bring it back to room temperature and bake the day of. But if need be, you could make the shortcakes ahead of time. Wrap them very tightly (I usually individually wrap each one in a layer or two of plastic wrap, and then put them all in a zip top freezer back) and freeze until the night before you need them. Leave them out on the counter to come to room temperature (i.e. don’t microwave them or anything), then slice and add the fruit and cream. I hope you enjoy them! Thank you for the quick reply! I will probably have to bake and then freeze as I realized I won’t have access to an oven the day of. So that makes the decision easy! Thanks again. again with the almond flour! AARrrg! I dont want to try this recipe until I know what to sub for the almond flour. Yes, many of my recipes are almond flour based. You might try subbing cashew flour.